^ Trimble, Virginia Louise (1973). 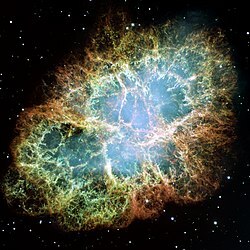 “The Distance to the Crab Nebula and NP 0532”. Publications of the Astronomical Society of the Pacific 85 (507): 579. Bibcode: 1973PASP...85..579T. doi:10.1086/129507. ^ Kaplan, D. L.; Chatterjee, S.; Gaensler, B. M.; Anderson, J. (2008). “A Precise Proper Motion for the Crab Pulsar, and the Difficulty of Testing Spin-Kick Alignment for Young Neutron Stars”. Astrophysical Journal 677 (2): 1201. arXiv:0801.1142. Bibcode: 2008ApJ...677.1201K. doi:10.1086/529026.